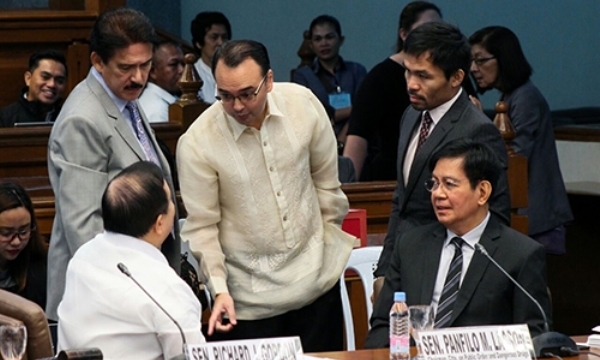 The resolution expressing the sense of the Senate that the late strongman Ferdinand Marcos is “unfit” to be buried at the Libingan ng mga Bayani lost with a plenary vote of 8-6-6 Monday. The motion to approve Senate Resolution 86 was lost after it failed to reach the needed majority votes of at least 11. Twenty senators were present in Monday’s plenary session. In explaining his abstention, Escudero said there must be an end to the 30-year debate on the life and death of the former President. “Thirty years na tayong nahahati sa ating bansa sa pagitan ng dalawang apelyido: Aquino o Marcos. Tama naman na siguro, sapat na ang panahon na ginugol natin para sa away at bangayan na ito,” Escudero said. “Tama naman na siguro na bigyan ng konting pansin, mas mahabang panahon yung nakakaraming kababayan na hindi sikat ang apelyido,” he added. In 2011, Escudero’s father, the late Sorsogon Rep. Salvador Escudero III authored a resolution at the House of Representatives urging then-President Benigno Aquino III to allow the burial of Marcos at the Libingan ng mga Bayani. The resolution got close to 200 signatures. Sen. Bam Aquino, however, said the issue was not just about two families. “Nahihiya ako kapag sinasabi na ito’y issue lang ng Aquino at Marcos. Nahihiya ako sa libu-libong namatay, sa libu-libong nawala, sa libu-libong na-torture,” Aquino said. “Ang isyu po ng libing ni former President Marcos sa Libingan ng mga Bayani ay hindi lang isyu ng ilang pamilya. Hindi lang po ito isyu ng mga biktima ng Martial Law, kundi isyu ng ating bayan at ng ating kasaysayan,” he added. Bam is the nephew of the late Senator Benigno “Ninoy” Aquino Jr., a key opposition figure during the Martial Law era. Most of those who voted against the resolution said they did so out of respect for the Supreme Court (SC), which decided 9-5 to dismiss petitions opposing the hero’s burial for Marcos. Senator Angara, for his part, said a referendum should be conducted on the issue. “Of the many issues that are important in our public life, it is through a national referendum that we can move on from this issue,” Angara said. In the barangay and Sangguiang Kabataan (SK) elections next year, Angara said a line can be placed in the ballot which asks voters if they are in favor or not of Marcos being buried at the Libingan. “I am sad that the Senate missed the opportunity to defend the truth and our history from the Marcoses’ historical revisionism and negationism. It missed the chance to be on the side of real heroes,” Hontiveros said. De Lima, who intends to appeal the SC decision, said the Senate should take a stand on the matter considering that it is the Executive branch, co-equal and separate branch of government, that will implement the burial. A group representing families of victims of enforced disappearances during Martial Law had earlier asked the SC to reissue its stay order against the burial.